The Danforth St. shooting occurred just three months after 26 pedestrians were mowed down by a van in the city's north end. People place flowers and candles at a makeshift memorial remembering the victims of a shooting on Sunday evening on Danforth, Ave. in Toronto on Monday. 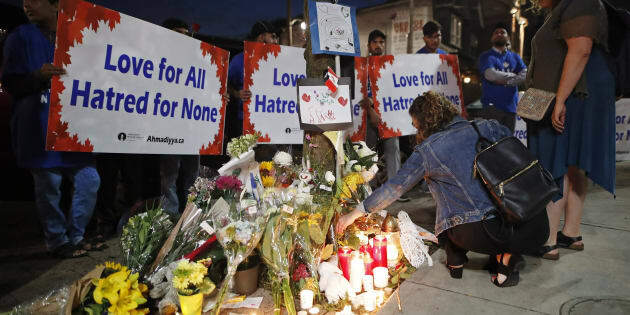 TORONTO — Deadly incidents such as April's van attack and Sunday's mass shooting in Greektown may have residents feeling as if Toronto the Good has become Murder City Canada, and has left some wondering whether the country's largest city is a safe place to live. Feelings of fear, anxiety and powerlessness are a normal response to such violence, said Dr. Katy Kamkar, a clinical psychologist at the Centre for Addiction and Mental Health, whether a person directly witnessed an event or heard about it through the news or social media. "We know this incident was very traumatic, very grave," Kamkar said of Sunday night's shooting, which injured 13 and left three people dead, including the gunman. The mass shooting occurred just three months after 26 pedestrians were mowed down by a van on Yonge Street in the city's north end. Alek Minassian, 25, was charged with 10 counts of first-degree murder and 16 counts of attempted murder after the attack. In between, there have been numerous gun-related incidents, including one that took the lives of two Toronto rappers and another that sent two young schoolgirls to hospital with bullet wounds. "Certainly when we put it in context, we can appreciate the accumulation of events, increased shooting that we hear about or the city being on high alert ... that can lead to feeling more anxious and fearful," Kamkar said. Kiran Brar of Victim Services Toronto said the organization's crisis hotline had received about 80 calls by midday Monday from people seeking counselling in the wake of the shooting in the city's popular east-end area, a hub of restaurants, bars, businesses and homes, as well as site of the annual Taste of the Danforth, which celebrates Greek food and culture. The 24-7 crisis line typically receives about 30 to 40 calls a day, said Brar, director of the Victim Crisis Response Program, who expected that counsellors would field the majority of calls Monday evening as fallout from the incident prompted more people to reach out for help. "It could be victims who are directly impacted who were there, it could be the families of the injured, the families of the deceased, individuals working in the area, passing by, or people deeply impacted by just hearing about this," she said. We know this incident was very traumatic, very grave. For those directly involved in a tragic incident like the Greektown shooting, the most prevalent emotions expressed are usually anger, fear and guilt — "the guilt of 'I shouldn't have gone there' or 'I should have left early'... or 'I should have done more,'" Brar explained. "We talk people through it. So it's having a conversation that supports and is empathetic, but also talks about the reality of the situation or any of those things that are adding to their stress." The crisis line also gets calls from people who are so rattled by such a violent incident, they say they're afraid to leave home, Brar said. "They can sometimes even be not in Toronto." Kamkar said those who are experiencing fear, anxiety or other disturbing emotions in reaction to the spate of violence that has rocked the city should "engage in proactive coping strategies" — maintaining their daily routine, practising self-care and seeking support by staying connected with family and friends. "When we hear of increasing incidents, it actually can increase vulnerability," she said, advising that if symptoms persist, professional help should be sought. The Victim Services Toronto crisis line can be reached by calling 416-808-7066.